Mayor Bloomberg Tries To Ban…..Soda?!?!?! Nope, the title isn’t a joke. Our dear Mayor Bloomberg had actually tried to ban soda. 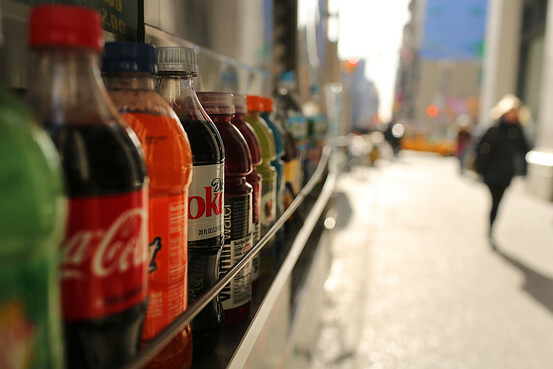 You see, Bloomberg proposed a soda ban, which would have prohibited all restaurants, fast food establishments, delis, sports venues, and movie theaters, from selling non-diet soda and other sugary drinks, in quantities greater than 16 ounces. Exempt from this ban would have been grocery and convenience stores. But as of right now, it looks like Bloomberg’s soda ban won’t see the light of day, since, as of last Monday; a judge has blocked his proposal. So I take it many of you now think this is all over, right? If so, then you don’t know our mayor. Sticking to his beliefs, Bloomberg is appealing the decision, and states that he will continue his fight. So why is Bloomberg so gung-ho on this? Well, he believes this would be a positive step in fighting obesity. Bloomberg was quoted as saying, “With so many poor neighborhoods suffering from obesity…It would be irresponsible not to try to do everything we can to save lives. I’ve got to defend my children, and yours, and do what’s right. Obesity kills. There’s no question, it kills.” Studies have shown that this epidemic will claim the lives of 70,000 Americans this year, 5,000 of whom live in New York City. Okay, I get that his heart is in the right place, but does he really believe that banning drinks larger than 16 ounces will actually stop this epidemic? With grocery and convenience stores still allowed to sell these drinks, people will just go there instead. All this would do is increase profit to these stores. We as Americans, have the right to make our own decisions, and that applies to what we choose to put in our bodies. Mayor Bloomberg wants us to start eating healthy, something I completely understand(and happen to agree with), but he can’t make the decision for us. That choice remains with us and us alone. Forcing the decision on people will only cause them to rebel. 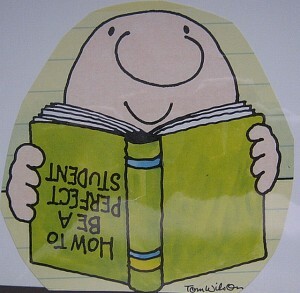 So please Mayor Bloomberg, let go of this foolish ban, and focus on more serious topics. Leave the sodas alone!! As undergraduate students in a technology college, most of us students have come to City Tech with a specific educational goal in mind. Possibly you want to go for a degree in Hospitality Management. Maybe you’d prefer a career in electrical or mechanical engineering. Or perhaps you choose to get your education in a healthcare field. No matter what field you choose to enter, there are certain core requirements, or general education classes, that you will be required to take as part of your degree. Many students wonder why they are required to take these classes. Why do engineering students have to take humanities courses? Why should art students have to take sciences? Students may be shocked to find out that there is much research on this matter. In fact, New York City College of Technology has a committee that is focused on improving the quality of the General Education experience at the college. This committee works on the core requirements of all the degrees and is comprised of professors in all of the schools within the college as well as other key administrators and staff of the college. On Thursday, March 7, this committee had a meeting with representatives from the student body to form a coalition to improve the visibility of the General Education component of the curriculum. This committee is in the process of putting together a contest on this matter. To prepare for submissions into this contest, let’s start brainstorming, what does General Education mean to you? 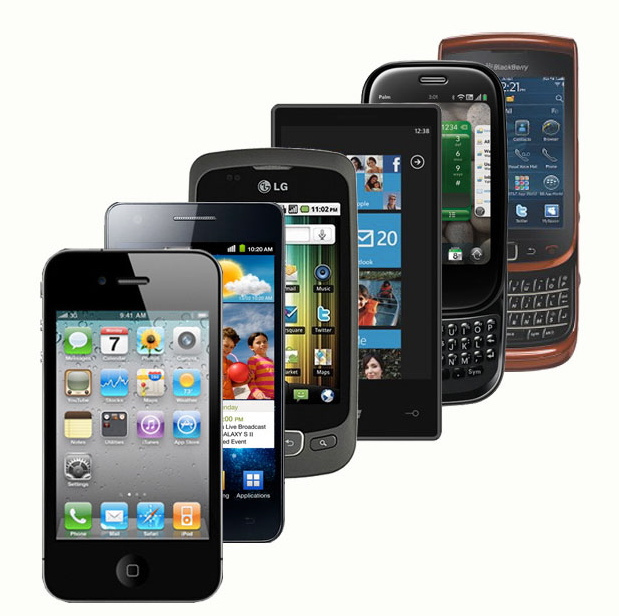 According to an infographic published by Go-Gulf.com in 2012, there are over 91.4 million smartphones in the US and that number is expected to balloon up to 252 million by 2016. Smartphones, being the plethora of personal information that they are, have managed to become sizeable targets for computer hackers, becoming more and more attractive as targets as smartphones and their applications become more and more integrated in your everyday life. So how does the average user (with Facebook, banking apps, email and all) protect their information? Questionably legal but generally convenient, jailbreaking your phone allows you to do many things, including accessing apps that aren’t allowed on the Apple or Google marketplaces, uninstalling bloatware (the useless irremovable software that comes pre-installed on your phone) and illegally swapping that $800 phone to a the carrier with the cheapest prices. While those are all tempting reasons to jailbreak a phone, the cons far outweigh the pros. The third party apps available to jailbroken phones do not have to measure up to the same standards as app store or market place applications. A great example is the Australian born ikee worm that infected jailbroken phones that had a Secure Shell(SSH) app installed. While harmless, it would replace your phone background with a picture of Rick Astley but the fact that it could change anything on a phone at all made it a huge security risk. Another issue with jailbreaking your phone was the risk of ‘bricking’ it – meaning that somewhere in the process of tampering with your phone, you corrupted its firmware making the phone unresponsive to touch or button presses. While there is a chance a phone can be fixed, if it can’t be unbricked, you’ll have to shell out for a new one. Last but not least is the all-important warranty issue. If you tamper with your phone it voids your warranty. End of story. When you download an app on an android phone you’re given a list of all the permissions that application will need to use after it’s installed. Those permissions can include tracking your location via GPS, reading your phones contact data, editing your personal information (calendar data, etc.) and sending text messages on your behalf. Generally speaking, if an application is asking permission to use thing it shouldn’t require to function properly, you shouldn’t download it. While it’s true that many non-malicious apps ask for extra permissions, there are – an alarming number are. 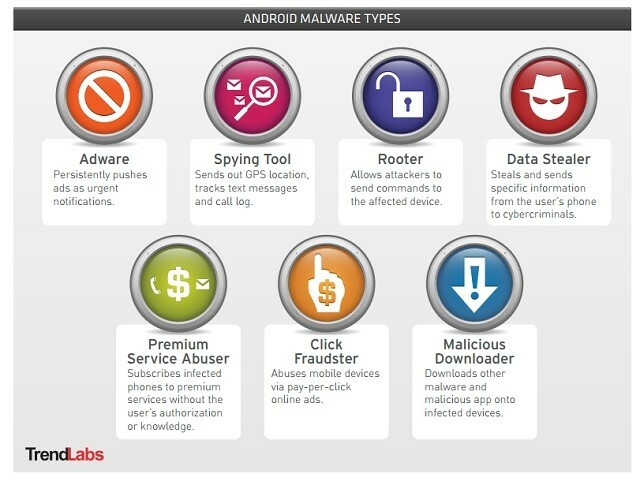 Trend Micro a reputable internet security company made an early claim that there would be at least a million cases of malware in android apps in 2013 and then backed it up by scanning 2 million apps. 1 in 10 of 2 million scanned apps were suspected to be malware. Permission related threats to android phones. Hands down, Android phones are the most vulnerable phones on the market. With so many versions of the operating system out, it is difficult to issue patches for security vulnerabilities that pop up and that leaves the job of protecting the phone from viruses to good antivirus software. For the android users: some good apps to look into are AVG Antivirus, Lookout Security, Norton Security Antivirus and Antivirus and Mobile Security by TRUSTGO INC. Non-jailbroken iPhones don’t have to worry about antivirus software as the few loopholes in iOS are fixed quickly and efficiently when found. While trying to trigger nostalgia in an older audience (who grew up with the original “The Wizard of Oz“) and simultaneously aiming to enchant younger viewers, Disney did not accomplish either. In this version, director Sam Raimi portrays the story of Oz, from the point of view of the Wizard himself. In previous productions, such as “Wicked” and “The Wiz”, the story is told from the point of view of more commonly explored characters; such as the Wicked Witch and Dorothy. All together the film bears some inconsistencies. Oscar “Oz” Diggs, played by James Franco, seems too childlike for the role; his development into “The Great and Powerful Oz,” never quite happens in a notable way. When his character does transform into the honorable and inspiring leader he was bound to become, it doesn’t feel convincing. Like in the 1905 version, Oscar Diggs gets thrown into the Land of Oz by a mysterious twister storm. The establishing shot of a sepia-toned Kansas is transformed into a vibrantly colored city. Not only that, but the aspect ratio of the screen changes too. While in Kansas, the screen is small and square-like. After landing in Oz, the screen ratio becomes widescreen. Like Dorothy, he walks along the yellow brick road accompanied by friends who resemble people from his old life in Kansas: a comedic and loyal, flying monkey and a sarcastically sweet and resourceful china doll. Also like Dorothy, Oz must face a witch. But which witch could I be referring to? You see, in Raimi’s rendition there are three. While in Emerald City, he finds himself in the middle of a battle between siblings, Glinda the Good-Witch and the Wicked Witches of the East and West. Even now I’m not certain which witch was wickedest. 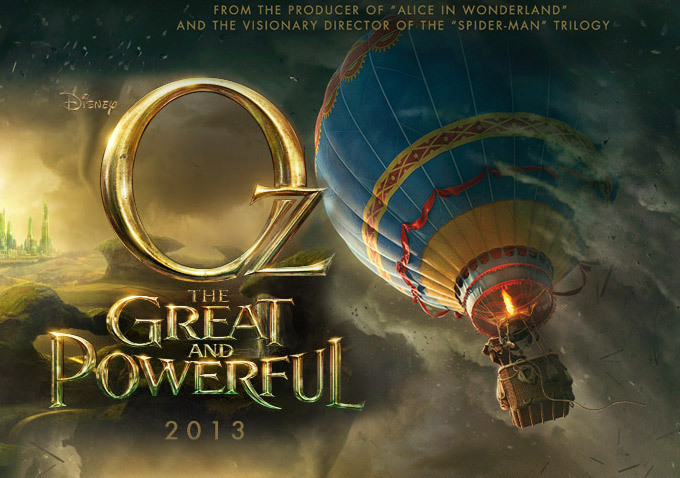 Out of high hopes, I really wanted “Oz the Great and Powerful” to be a prestigious and noble man. Unfortunately, we realize he is a deceitful, greedy, womanizer. Specific themes that are addressed during character developmental scenes don’t seem suitable for the child viewers. Some characters were downright terrifying (Wicked Witch’s Baboon minions). Also the story line doesn’t seem attention grabbing for a younger audience. The film was overall entertaining. If you are watching with expectations of the 1905 film in mind, you will be highly disappointed. For what it lacked in acting and plot development, the movie made up for in beautiful costumes and set design. One final note I have to get off my chest about Mila Kunis’s character, Theodora. While portraying the Wicked Theodora, her cackling induced flashbacks of her family guy character, Meg. Anyone else sick of these MTA fare and toll hikes?! On March 3, 2013, MTA subway, bus, commuter rail fares, and tunnel and bridge tolls, all went up in price. The fare for subways, local buses, SIR, and Access-A-Ride rose to $2.50; the fare for express buses rose from $5.50 to 6.00. 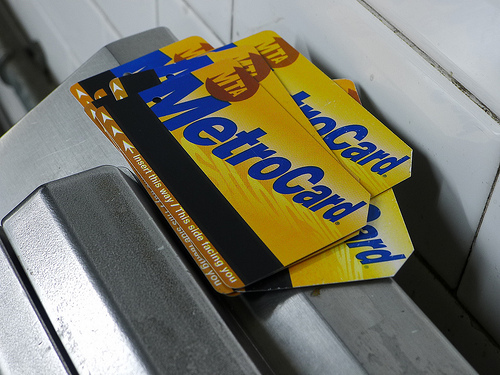 A single-ride ticket purchased at a Metro Card machine will now cost $2.75. The MTA says that most commuter rail tickets will increase between 8.2% and 9.3%, depending on the ticket type and distance traveled. The 30-day unlimited-ride Metro Card will cost $112, up from $104. The 7-day unlimited-ride Metro Card will cost $30, up from $29, and the 7-day express bus plus Metro Card will cost $55, up from $50. I don’t know about anyone else, but I for one am sick of this! It seems like just yesterday tokens cost $1.50. Boy, look how far we’ve come. Now, twenty five cents more, may not seem like a much, but when you make multiple trips along with having other expenses, such as bills and tuition, it sure does add up to a lot. Oh, how I miss the days of high school, when we were given free metro cards. Now, looking back, I realize what a life saver those things were. What really pisses me off, though, is the fact that you now have to pay an extra dollar to buy a new metro card. Oh, but wait, the MTA was “gracious” enough, to let us exchange our expired, or worn out cards, for a free new one. Um…thanks guys? What’s worse, is the fact that there are people who are still dealing with the ramifications of Hurricane Sandy. These poor people are already in dept, and now they have to add this to their worries. What disgusts me even more; is that this decision was made AFTER Sandy happened. Many subway tracks aren’t even properly fixed yet, since Sandy destroyed them, but the MTA still has no problem raising prices. Honestly, I can’t even say I’m shocked by the pay hike. The MTA board has proven time and time again, that they don’t care about their customers. If they did, these pay hikes would never have happened. So, for us, who are without cars of our own, we are left to suffer. Seriously, get it together MTA! So, I know that many students in City Tech are looking to get the most out of their education. I also know that many of those students have difficulty with many of their classes. Students attend tutorials, actually pay tutors the big bucks, and buy study books galore. What many of them don’t know, is that there are actually faculty out there who are waiting for you to knock down their doors. 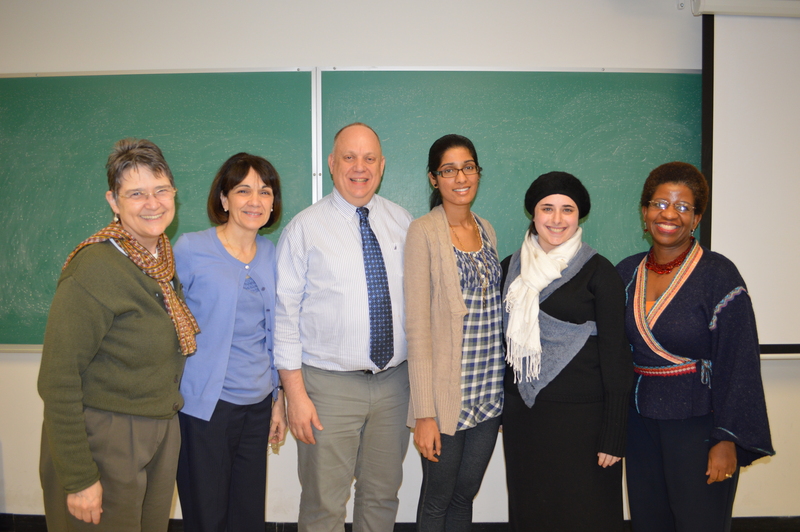 Did you know that these faculty actually have a mandatory number of student advisement hours? If we don’t go to them during their hours, what are they being paid for? Their really waiting for you to come, and they want to help you with your classes. They also want to help you with other aspects of college life. Your faculty are the ones who’ve been through college, they’ve been through more life than you, and by the way, they’re the ones who are going to right letters of reccomendation for you. Don’t you think you should do yourself a favor and get yourself a mentor? It’s actually not very hard to find a mentor. It goes something like this. You find a professor, find out their office hours, and go visit them. Take it from an experienced mentee. It’s a sure way to find a mentor. For semesters students have been complaining about the lack of Wi-Fi support for Android powered devices – left out in the cold in favor of Apple products. iPhone and iPad users have been able to connect to the internet by downloading the Bradford Mobile Agent App off the Apple App store Spring 2012, however recent improvements have allowed the school’s network to finally support Android devices. Granted, Droid enthusiasts will have to register each device with Computing Information Services by heading down to the Student Welcome center and giving them the device’s MAC address, but that’s relatively simple considering how difficult it can be to get a PC or Mac authenticated for use on the net. Connect to the ‘NYCCT’ wireless network. The password is “NewYorkCityCollegeOfTechnology”. Go down to the help desk located in the Student Welcome Center (1st floor Atrium) and give them the MAC address of the device you want registered and your college email. Within 2 days, your device will be approved for internet access. *Note: For this to work you must have an updated antivirus program and your operating system must be up to date with security patches. Note 2: You must do this EVERY time you want to connect to the campus Wi-Fi. The Bradford Dissolvable Agent will be downloaded to you computer. Open the file and click run. It’ll take a little while and you may have to do all this more than once, but once the program is successful, you’ll have internet. Download the Bradford Mobile Agent App from the Apple store.